I always need to make page flip books for my clients and send to them. For convenience, is it possible to have a way to email directly once the flipbook is published, and my client can run the flip publication just with ease by clicking the icon on PC or Mac? Please advise. The A-PDF FlipBook Maker solution provides you with more than one publish method, including email directly after publishing. You can learn this from below tutorial. Step 1 : Run FlipBook Creator and start a new flipbook project with PDF, Office document or images. Step 2 : Design the flipbook style with a rich set of setting options. 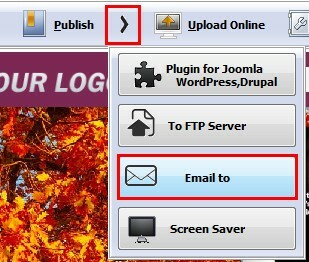 Step 3 : Click the Arrow icon near the Publish icon, and select “Email to”, then configure the email information including target email address, subject and message. Step 4 : Confirm email and set output option, then click Convert. Step 5 : After publishing finished, the Windows Office Outlook will be opened for sending email with flipbook attached.